Five-dollar footlong, you say? Herb’s Carry-Out wasn’t *quite* as expensive as Subway, back in the day. 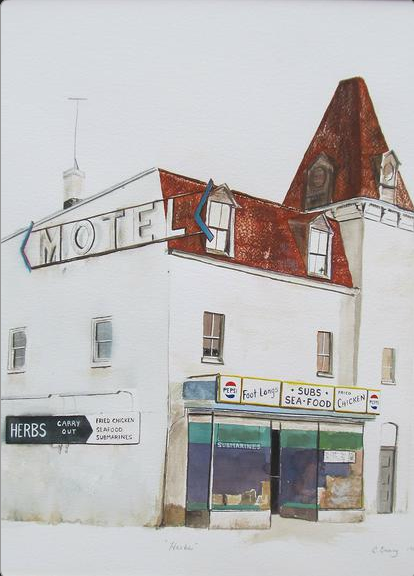 The vintage (and greasy) Laurel icon, brilliantly captured here in watercolors by artist Cathy Emery, was a longtime, late night staple just a block south of Main Street at 126 Washington Blvd. 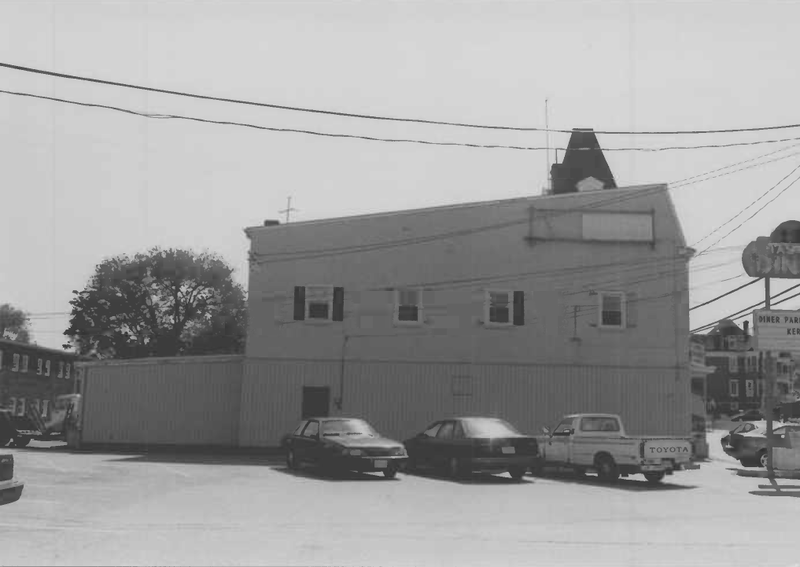 The sight of its unique facade brought back a flood of food memories on Facebook, as Laurelites recalled their favorite dishes—and memories—from Herb’s. 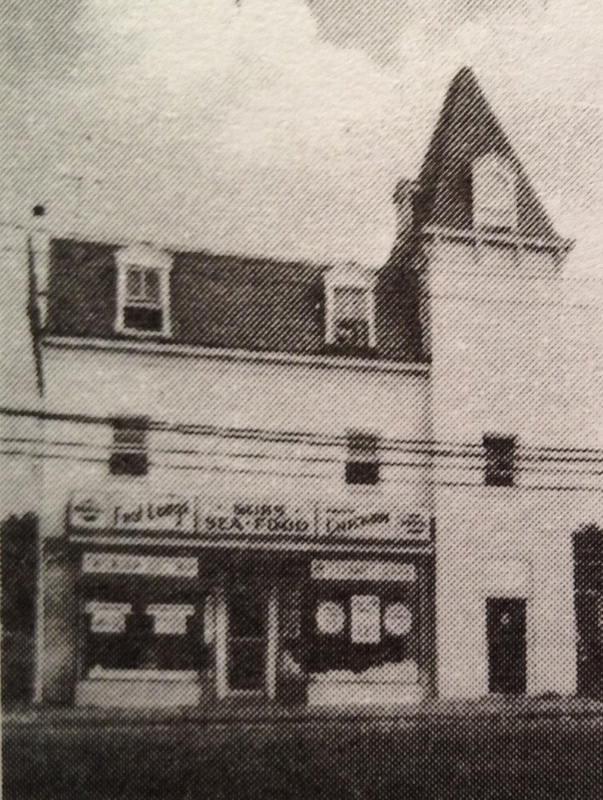 Several mentioned the shrimp and gizzard boxes, while others cited the cheesesteaks, footlong hot dogs, and soft shell crab sandwiches—often after a night out at the nearby B & E Tavern. Cathy Emery apparently remembered them, too, as they appear to be lovingly included in the painting. 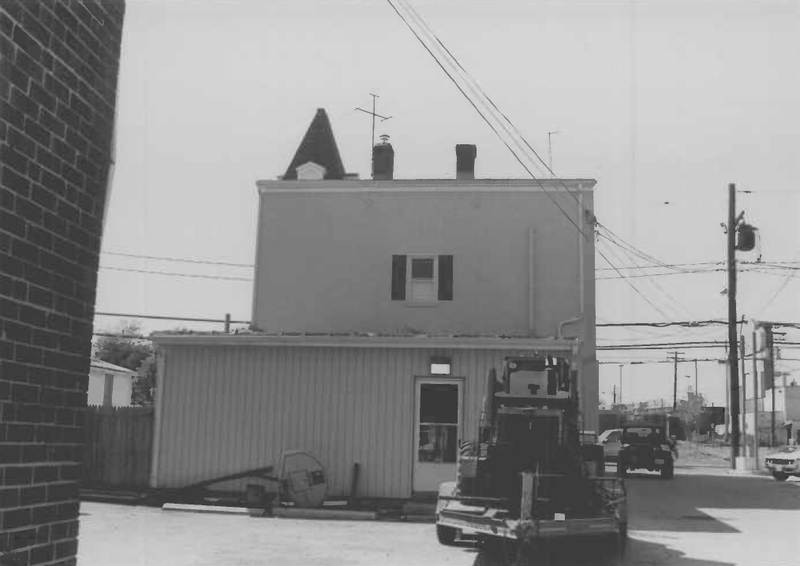 The Laurel Centennial Souvenir Historical Booklet has a small photo of Herb’s from circa 1970, and includes an interesting background on the building before all the gizzard boxes and cheesesteaks came. 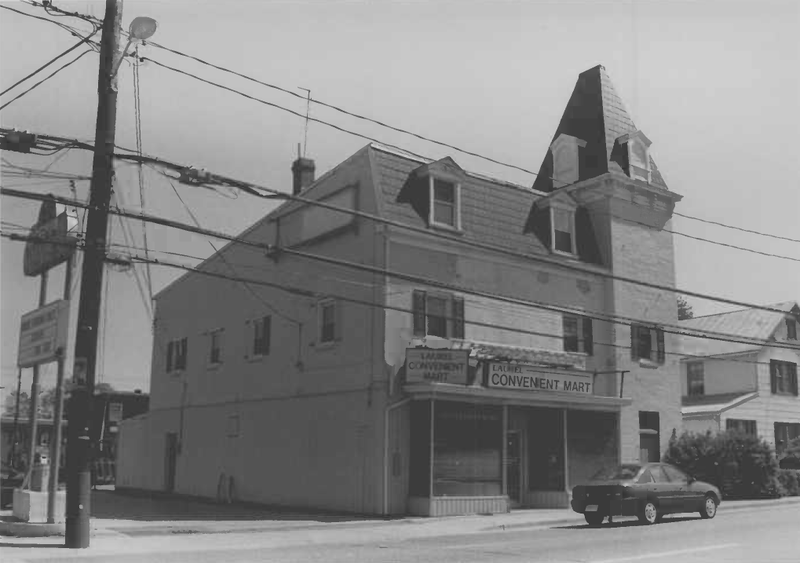 The Maryland Drug Company was a long-time tenant before Herb’s occupied the street level store. (The upper floors were converted into apartments at some point.) But its history goes back much further. 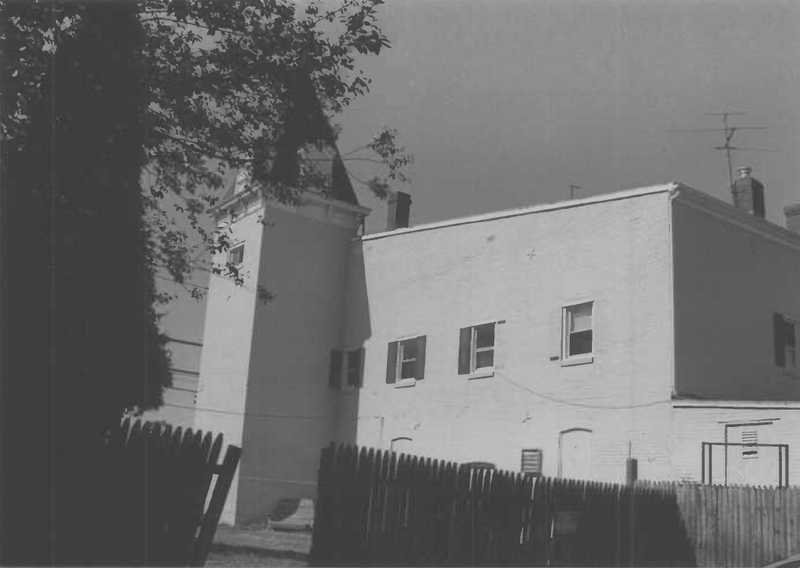 In fact, according to the Maryland State Archives (who produced a fairly extensive capsule summary sheet on it in 1998), The Free Quill Building, as it was originally known, was constructed circa 1885 on land owned by James A. Clark, the editor of the Free Quill—Laurel’s first long-term weekly newspaper. The upper floor of the building was an open hall which was used for public meetings and dances (Centennial Booklet 1970: 54). 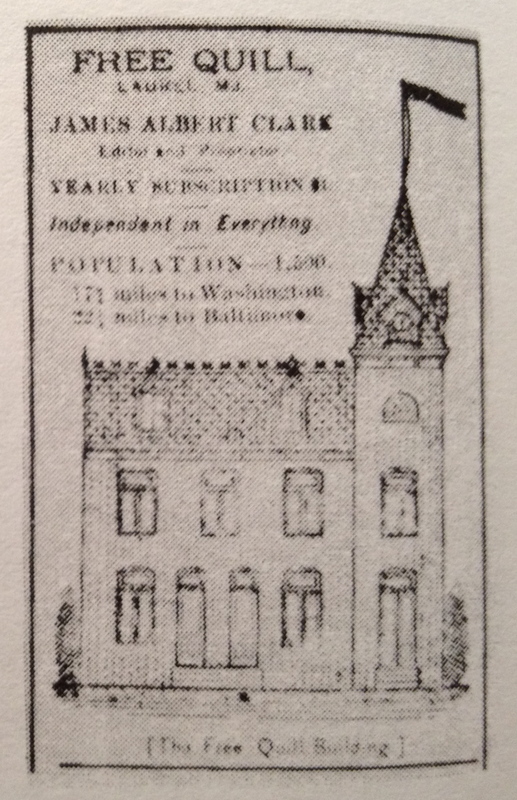 The Free Quill eventually became the Laurel News Leader, but it is unknown where the paper was produced after Clark sold the property. The property was conveyed to Charles Shaffer in 1895, and was sold to Edmund Hill in 1898.Edmund Hill ran a butcher shop out of the building, and continued to use the upper hall as a public meeting space. The heirs of Edmund Hill sold the property in 1919 to Ormand Phair. Ormand Phair had purchased the adjoining residential property in 1910 from Charles Shaffer. 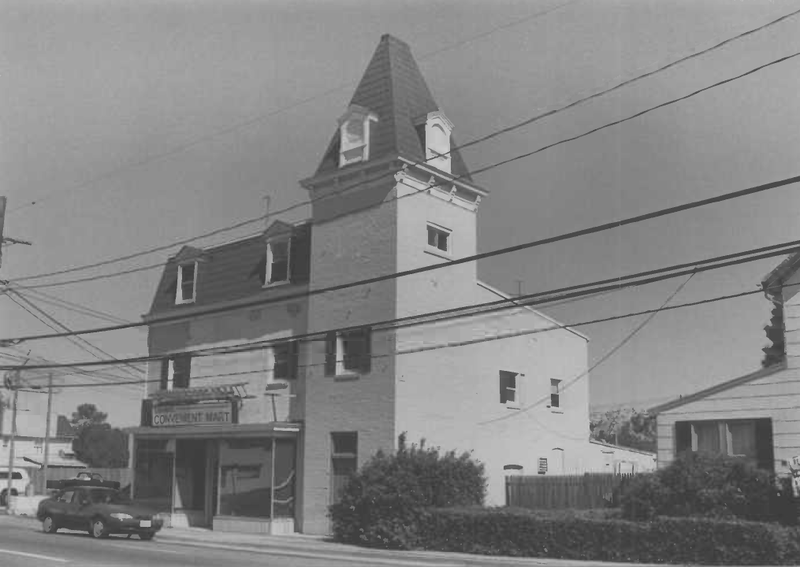 Trustees for Ormand Phair sold both properties to the Maryland Drug Company in 1958. 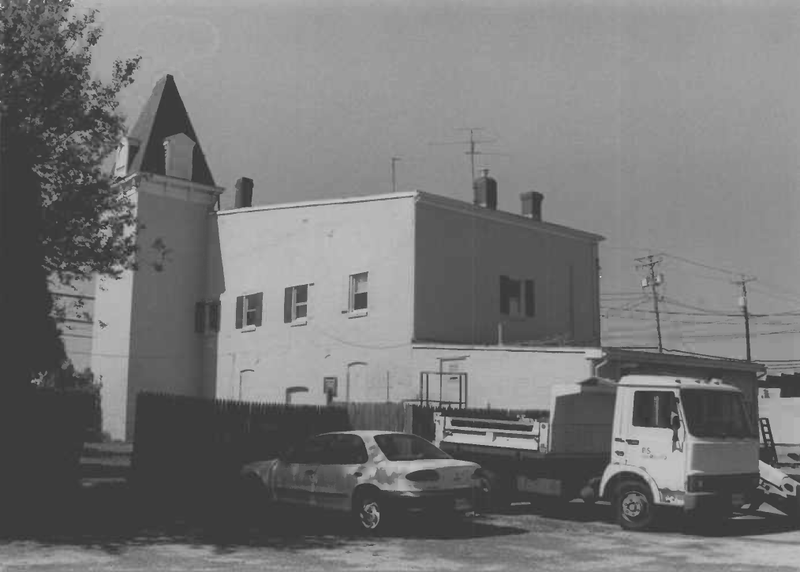 The current owners purchased the property in 1973. 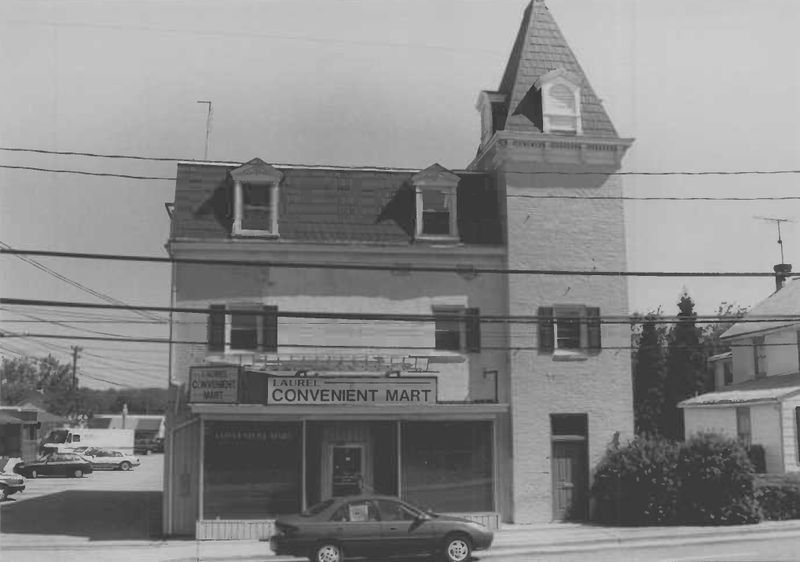 Also included in the summary is a series of elevation photos taken in May 1998—when the street level storefront bore the rather generic name, “Laurel Convenient Mart”. At the time, fittingly, the building was vacant. 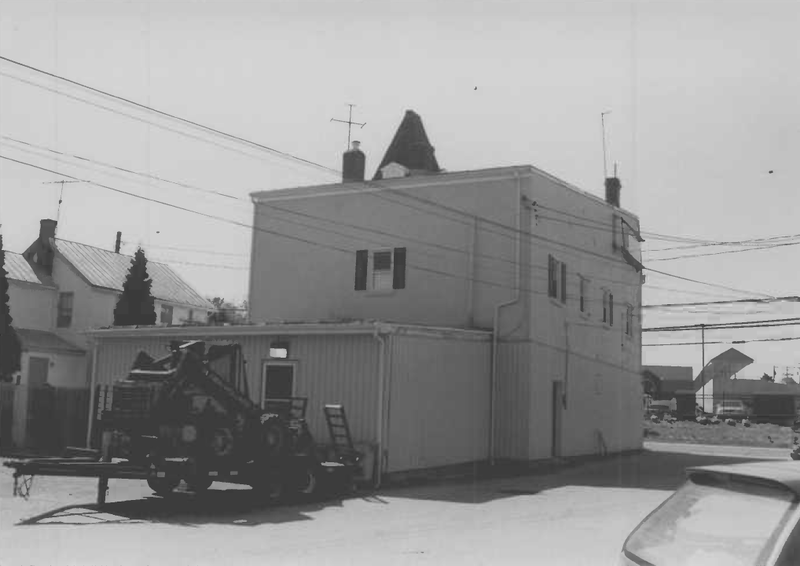 The old turreted building still stands, albeit empty once again, since its last incarnation as Dingle’s Printing. I remember thinking it was odd to see a printing company in the space I always associated with Herb’s Carry-Out, but as it turns out, the building was originally used for printing purposes. In addition to the Free Quill, the Illustrated Residence and Business Directory of 1894 (only two complete copies of which are still known to exist), was also printed in this building. That directory, another Laurel first, was thankfully reprinted in the Centennial booklet for posterity. The property is not eligible under Criterion A, as research conducted indicates no association with any historic events or trends significant in the development of national, state, or local history. Historic research indicates that the property has no association with persons who have made specific contributions to history, and therefore, it does not meet Criterion B. 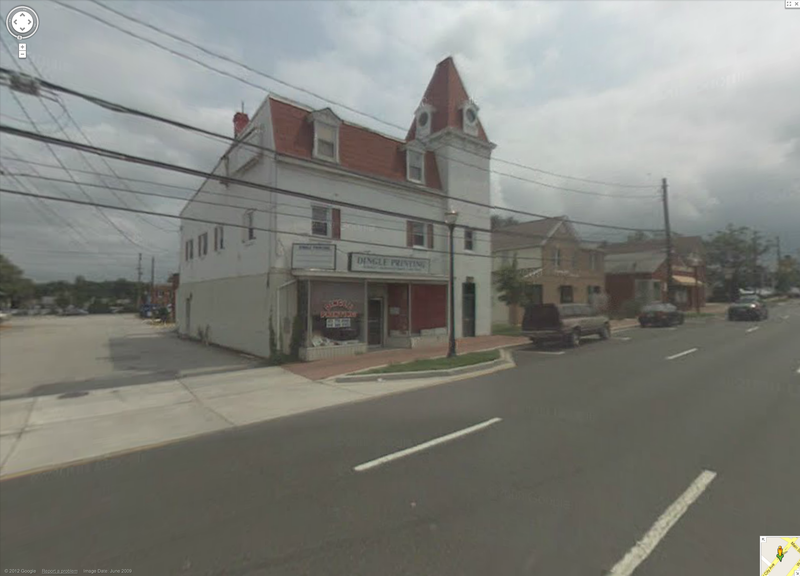 It is not eligible under Criterion C, as it is a highly altered example of an late-nineteenth century commercial building in Laurel. The first floor facade has been greatly altered with a modern storefront, and all the windows have been replaced and the larger openings filled in. The upper story which once served as a meeting hall has been converted into apartments. The building no longer retains its integrity of materials, design, workmanship, feeling, or association. Finally, the structure has no known potential to yield important information, and therefore, is not eligible under Criterion D.
Ouch. That’s some tough criteria. Historical significance has a funny way of recording itself, doesn’t it? This odd, old building may or may not have a long-term future. It’s not likely ever going to be protected by any preservationists. And its only noted contributions to the community occurred over 120 years ago. 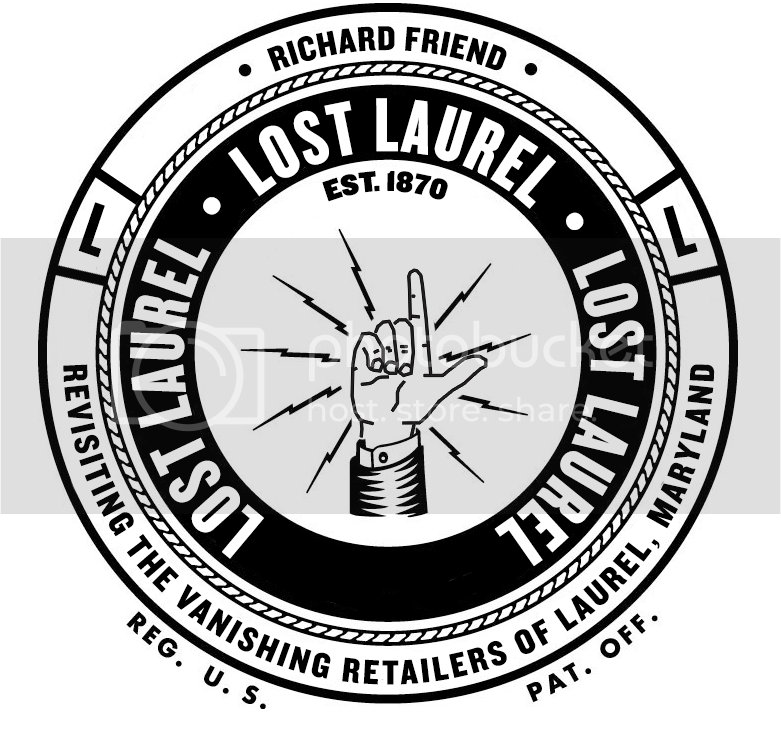 But if you talk to the people who knew Laurel in the gritty 1970s and early 80s, they remember it for something else entirely—Criterion E, if you will. That’s “E” for Eat at Herb’s. And as for “specific contributions to history”, etc., I offer this: in 125 years, nobody cared enough to paint a portrait of that building in any incarnation other than Herb’s Carry-Out. And I’d venture to say that there are at least a few buildings on historic preservation lists that haven’t been as lovingly painted, or painted at all. But then again, nobody ever bought a shrimp and gizzard box from their establishment. Herb’s was the place! My father would take us there and it was foot-longs for all. I remember the lights were so bright it was like an operating room. Thanks, Jennifer! Do you happen to have any photos of your grandparents and/or the restaurant that you can share? It’s always such a treat to see new images after all these years. Thanks again! Wow, how did I miss this? Yes! I can dig up some pictures and send them your way!